His analysis of the tone of THE APARTMENT, a film that I’ve been resistant to for a very long time, but which really came together for me when I watched it again a couple of months ago. Steyn notes how the film stays with the “bittersweet” without ever collapsing into “bitter.” And I’m convinced the last line in THE APARTMENT — “shut up and deal” — as good a walk-off line as Wilder ever wrote (and we’re talking the man who wrote, “all right, Mr. DeMille, I’m ready for my closeup” and “well, nobody’s perfect”). It’s weepy high-romance for the stoic and unromantic. His citation of the Jack Lemmon interview at the end, which, as Steyn notes, captures what is missing in today’s comedies without turning either Lemmon or Steyn into the equivalent of some old fart muttering in the corner about the damn-fool younger generation. 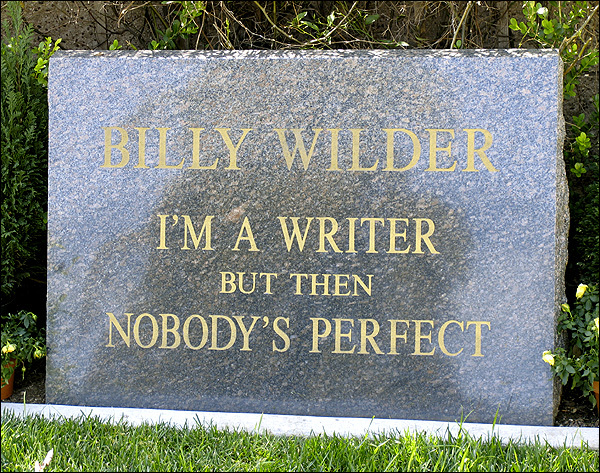 But Wilder had that craftsmanship. You couldn’t scramble the reels of SOME LIKE IT HOT and have much of it work from the inherent “sketch” funniness. The film is clockwork farce as good as the 20th century produced, and, like other sorts of clocks, can’t be disassembled and still have its “parts” work. Turner Classic Movies had a mini-retro of Wilder on his birth’s centenary, and I confess I didn’t watch any of the films, as I’d seen them all more than once before, preferring instead to mark the day on TCM by watching BILLY WILDER SPEAKS, the first US presentation of an edited-down interview documentary that German filmmaker Volker Schlondorff made for German TV almost two decades ago. (Schlondorff also wrote a personal memoir on Wilder’s passing for the LA Times last month, which had this priceless gem that explains part of what makes Wilder so congenial to myself and so many other Gen-X cinephiles: “Deflecting every serious moment with a joke, Wilder gained a reputation as a cynic. But for him it was only a question of dignity: The really serious things we should keep to ourselves.”) Wilder comes across as so, no other word for it, lovable in these interviews, like a wise old uncle that you could listen to for hours. Here in America, you don’t really worry too much about politics. If the Democrats win, great. But if the Republicans win, that’s not too bad either. This was a man who lost most of his family in the Holocaust — he knew political extremism from political extremism. He understood, although he might not have been able to put it in the precise terms that this former political-philosophy professor-wannabe will, that America has a political consensus, in which there are two parties that garner 95+ percent of the populace and basically both support the liberal democratic order. Politics operates within the 40-yard lines and isn’t really life-defining. This isn’t to say there are no differences between the two parties or that those differences don’t matter (and Wilder’s sympathies within that order are clear from the quote). But it is to say that revolution or the disruption of the social contract simply is not on the agenda, despite how the Kossacks and Atrioses of the world babble about “Bushitler” and the imminent theocracy. Those idiots have no perspective and deserve no respect (nor do the Birchers et al who claim the Democrats are just closet communists; but they’re not at the center of the “people power” movement that the MSM is telling us is reshaping one of the two major parties). It was good to be reminded of that again.